When we were kids, we always got our Christmas tree the last day of school before Christmas. We put the tree up on Christmas Eve and left it up until New Year’s Day. After I had my own home, I couldn’t get in the mood to decorate until Christmas Eve and I usually left my tree up until long after New Year’s Day. One year I even thought about turning my tree into a Valentine tree, a St Patrick’s tree, and an Easter tree, maybe even a 4th of July tree. It doesn’t seem like Christmas without a tree, decorated with cute little ornaments my children made when they were small, and little ornaments we had when I was a child. There aren’t many of those left now, but I love them. Of course I love a real cedar Christmas tree. I used to buy a real tree from the fire station every year. I love the smell of a Christmas tree, but an artificial tree is so much easier. Within the Christmas story is the story of the real Christmas tree, the cross. God became flesh, born of the virgin Mary as the Holy Son of God, Jesus Christ. 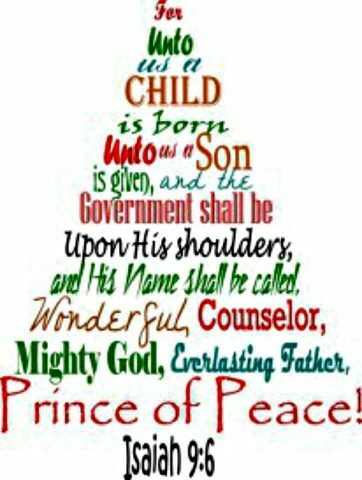 That’s the beginning of the story that continues with Jesus Christ on the tree, the cross of Calvary, giving Himself completely for the whole world. He died and was buried, but then rose again from the dead as our Savior, seated at the right hand of God, crowned as the King of kings. “Because Christ also suffered for us,…. who Himself bore our sins in His own body on the tree, that we, having died to sins, might live for righteousness.” I Peter 2:21-24 New King James Version. 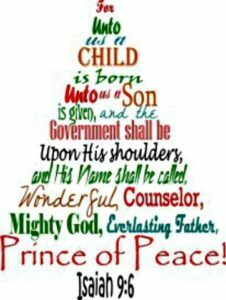 From the cross, a true Christmas tree, to a crown.